Jam Jesus confers divine approval on the consumer. 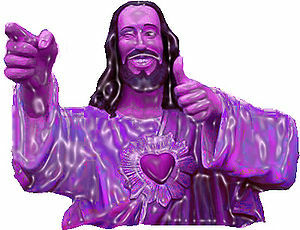 Wikipedia doesn't have a proper article about Jam Jesus. It really wouldn't help those so-called-experts by writing one either. Jam Jesus is a unique sandwich topping. Although it is enjoyed by people of all religions, Catholics believe that the grapes in the spread become the Body of Christ, whereas the peanut butter becomes His suntan lotion, or something. The Catholic Church in the health-conscious United States has advocated sandwiches with Jam Jesus as a more balanced Communion accessory than the traditional wafer. In the 1970s, as huge, gleaming cathedrals of televangelism were sweeping across Texas, the Catholic Church faced an existential dilemma. There were, at the time, two things to do in Texas on Sunday morning: Pay $5.99 for an all-you-can-eat buffet of brisket and sausage, or go to church and have a dry, stale, and utterly tasteless wafer placed on your tongue. There might be some Welch's to wash it down with, although depending on the progress of appeals of altar-boy lawsuits, Kool-Aid was often substituted. The Church would go out of business unless it found a more visceral appeal to substantial numbers of people. The solution was to devise tastier sacrificial condiments. The Host was replaced by a large slab of thick-cut, hot-out-of-the-oven "Texas toast" slathered with butter and Jam Jesus. Since offering a snack that is supposed to represent eating a human body doesn't affect anyone's appetite down there, slabs of steak with ketchup were available on the side. Bright pink in the middle, just the way they like it. Publicity for the calorie-enhanced Eucharist was a problem, and there were several false starts. The Archbishop of Houston authorized the replacement of steeple bells at churches throughout the Archdiocese with huge triangles, to be rung, dinner-bell style, before services. This did make stomachs growl, but most of the attached brains did not think to head to church. Before long, giant replicas of the Jee Man outside Catholic churches began to outnumber those of chubby boys in checkered shirts and suspenders outside Big Boy hamburger joints. Word of the Jam Jesus phenomenon reached Rome, and the Vatican sent Cardinal Joseph "Der Enforcer" Ratzinger (now Pope Benedict XVI) to check for possible heresy. Ratzinger was appalled by the concept of replacing the sacred thin wafer with something that looked liked the Savior dressed up as a jam doughnut. However, his instruction for excommunication and denial of confession for those responsible was overruled by Pope John Paul II. He deemed this peculiar culinary offering "infallibly tasty" and made it available (on request) to all Catholics who visit cathedrals outside their home country. Global quality control is achieved through the same contract manufacturer who markets a range of foods to Catholic congregations under the slogan, "The Last Supper Microwave-Ready Meals." In 1998, the U.S. Surgeon General declared that America was "a nation of fat bastards." A few years later, the new President, George W. Bush, declared that, "It's all those empty calories," as he was shoveling down a few dozen pretzels. There could be no doubt that he was referring to the communion Host that was still served outside his home state of Texas. However, Bush's "faith-based initiative," namely, beer vending machines in the vestibules of churches, never caught on. A decade later, as a new administration prepared to take over, First Lady Michelle Obama was asked about the Catholic sacraments. "No, in my adult life, I've never been proud of that either," she said. Her personal Victory Garden had no vineyard, and the Congress was now controlled by Nevadans and Californians, whose churches celebrate Communion by having the priest place bean sprouts and tofu on the tongue of the parishioner. A bipartisan consensus emerged that the solution to America's dietary crisis was heartier and healthier food service during church service. With second helpings at no extra cost. Although most of the laity visit McDonald's on a more frequent basis, the Catholic Church could proudly offer over twice the selection of special sauces as are available for Chicken McNuggets. However, none of the latter-day alternatives sold as well as original Jam Jesus. Some Protestant churches boycott these condiments, even banning them from Pot Luck Dinners. Their view is that Jam Jesus is the thin edge of the Catholic wedge to entice their congregations to "Popery" via weak-willed taste buds.